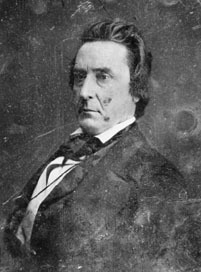 Born in Kentucky and trained as an attorney, David Rice Atchison first gained prominence representing Mormons near Kansas City, Missouri, who had seen their property seized by local authorities. Unsuccessful in having their property returned, he provided legal assistance as many of these Mormons resettled in nearby Clay County, and in gratitude the Mormons worked to have Atchinson elected to the state legislature in 1834. Four years later, acting as militia commander, he commanded the forces that expelled most Mormons from the state of Missouri. After two years as a state judge, he was appointed to the US Senate at the death of the incumbent, Lewis Linn. A slaveowner himself, Atchison was a staunch supporter of slavery in his dozen years in the Senate, opposing the Missouri Compromise and working to ensure that slavery would be legal in the new state of Kansas. Toward this end he toured the South, seeking immigrants willing to move to Kansas with their slaves, and he is the namesake of Atchison, Kansas, a town originally settled by slaveholding pioneers. After leaving the Senate he led one of several bloody raids on the free-soil town of Lawrence, Kansas. Addressing self-styled pro-slavery "soldiers" before the attack on 21 May 1856, he said, "This is the most glorious day of my life! This day I am a border-ruffian!" Falsely believed by some to have been President of the United States for one day (4-Mar-1849).